YES! 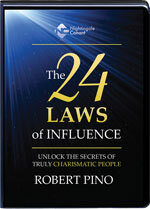 I want to gain the awesome power of influence to elevate my personal and professional potential. I’ll be able to identify and deflect influence from others, influence those around me, and influence my own results. If within 30 days, I am not closer to my goals as a result of my new influence skills contained in this program, I will simply send it back for a full refund. No questions asked.